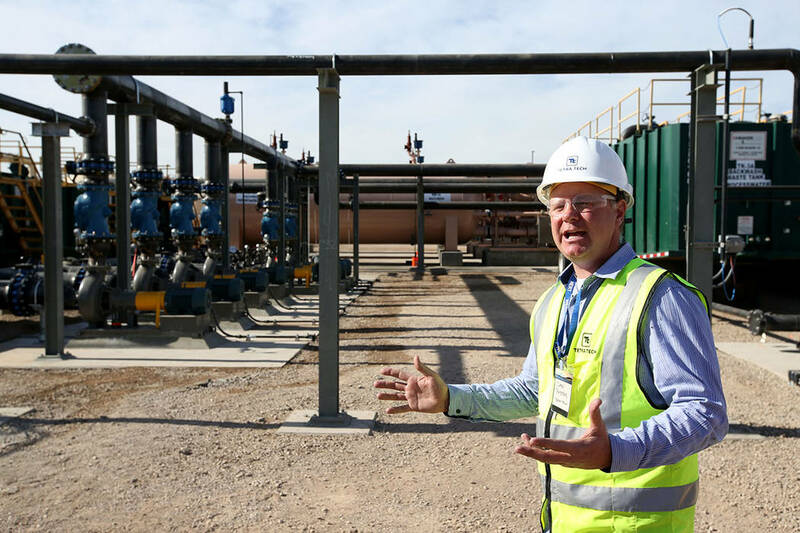 A new water treatment plant is now operating at the Las Vegas Wash to help keep pollution from a former chemical production site in Henderson from reaching Lake Mead and the Colorado River. You’ve heard of pop-up stores and pop-up restaurants, but what about a pop-up water treatment plant? 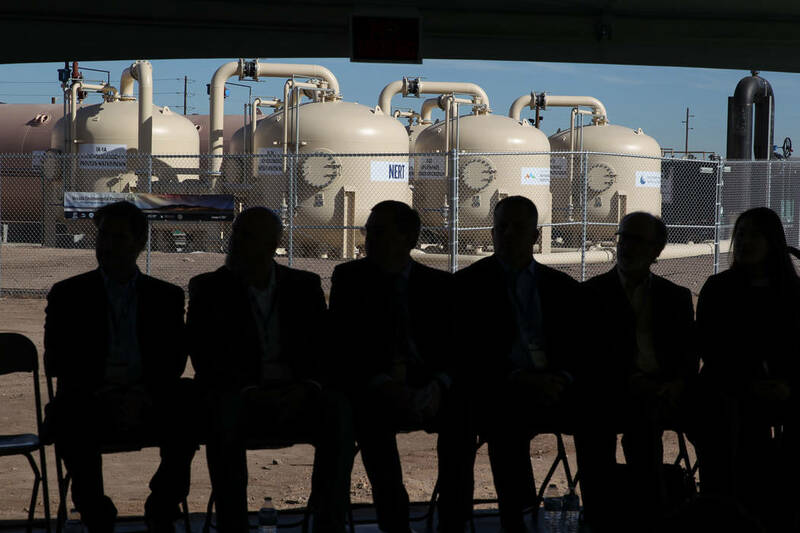 Environmental regulators and water officials gathered Thursday at the Las Vegas Wash to mark the completion of a temporary treatment facility designed to keep pollution from an industrial site in Henderson from seeping into the wash and flowing downstream into Lake Mead and the Colorado River. The temporary plant near the Clark County Wetlands Park’s Pabco Trailhead went online Tuesday. Over the next 18 months or so, it is expected to remove up to 3 tons of the hazardous chemical perchlorate from contaminated groundwater as it is pumped out of a construction site where the Southern Nevada Water Authority is building two flow-control structures called weirs to curb erosion in the wash.
JoAnn Kittrell, spokeswoman for the Nevada Division of Environmental Protection, said the treatment plant cost between $18 million and $25 million to permit and build. It was paid for out of a $1.1 billion settlement the federal government secured in 2014 from the owners of the chemical site responsible for the contamination. The U.S. Justice Department called the settlement the largest recovery for environmental cleanup in history. Without that money, the cost of cleaning up the contaminated groundwater seeping into the wash would have fallen to taxpayers, said David Johnson, deputy general manager for water authority. “This is how the system is supposed to work,” he said. 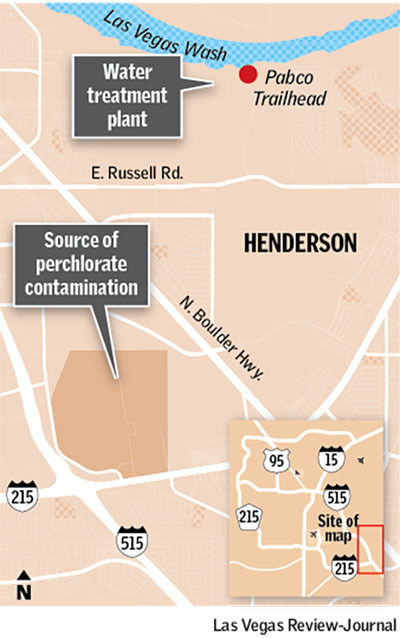 Perchlorate is a common ingredient of rocket fuel that was once manufactured in Henderson. In the late 1990s, the chemical was found in Lake Mead and the Colorado River water that supplies farms and cities across the Southwest, including Las Vegas. The contamination was traced back to the old Kerr-McGee chemical plant, northeast of U.S. Highway 95 and Lake Mead Parkway, where regulators discovered the nation’s largest plume of perchlorate. The EPA has yet to set a safe drinking water standard for the chemical, but a cleanup effort underway since 1997 has reduced it by 95 percent to barely detectable levels in Lake Mead. 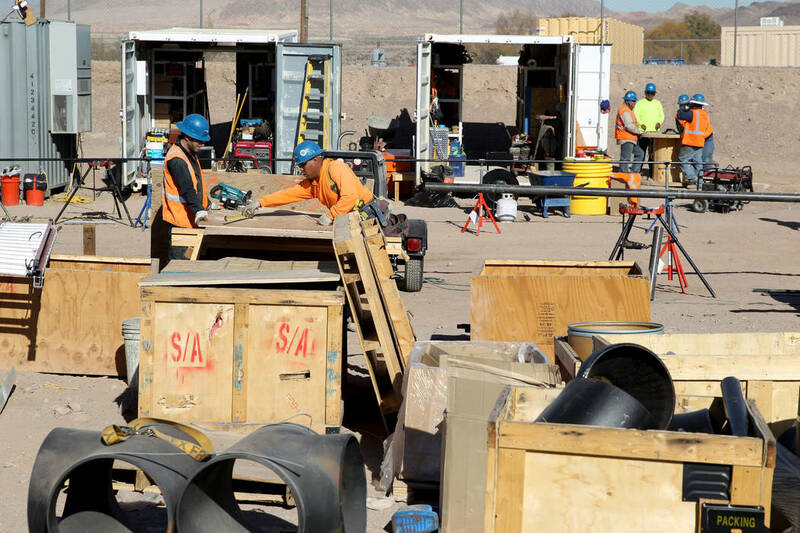 The new water treatment facility near the wash is being operated by the Nevada Environmental Response Trust, which assumed ownership — and cleanup responsibilities — for the site after its previous owner, Tronox Inc., filed for bankruptcy. Steve Clough, remediation director for the trust, said the plant required 54 permits from a host of federal, state and local agencies before it could begin operation. It can treat enough water to fill a typical backyard swimming pool every two minutes, Clough said. 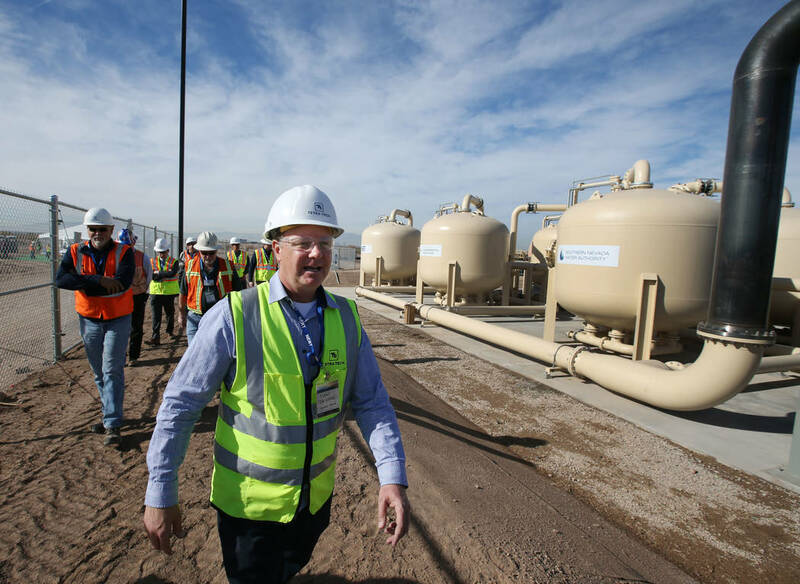 After the perchlorate is removed, the groundwater is released into the wash.
Johnson said the treatment technology being used is the best available for an operation of this type and scale, but it apparently won’t be around for long. 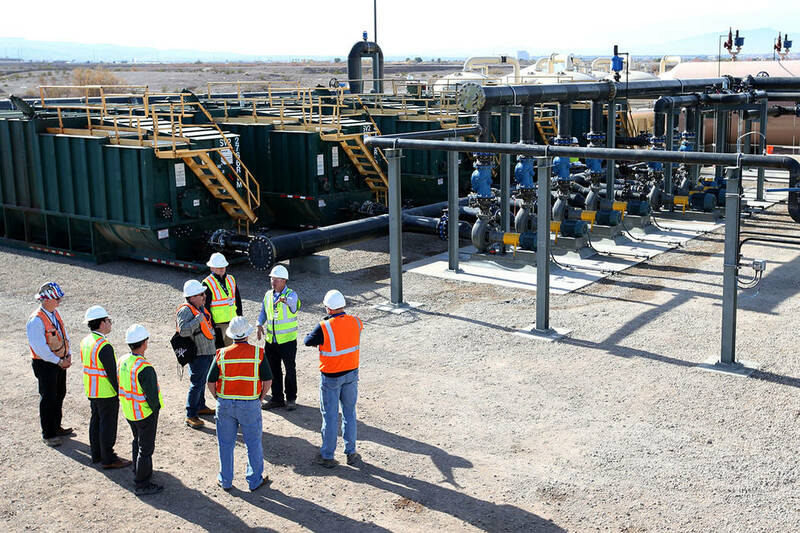 James Dotchin, industrial site cleanup chief for the Nevada Division of Environmental Protection, said the treatment plant will be removed and the site restored to its natural state once the authority finishes its work in the wash sometime next year.